You Can Never Tell at the Abbey - will audience settle Shaw and Wilde score? You Can Never Tell at the Abbey – will audience settle Shaw and Wilde score? BERNARD Shaw and Oscar Wilde may have been foes of the 19th century but with their two plays sitting side-by-side at Ireland’s national theatre – could old scores be finally settled with the audience? 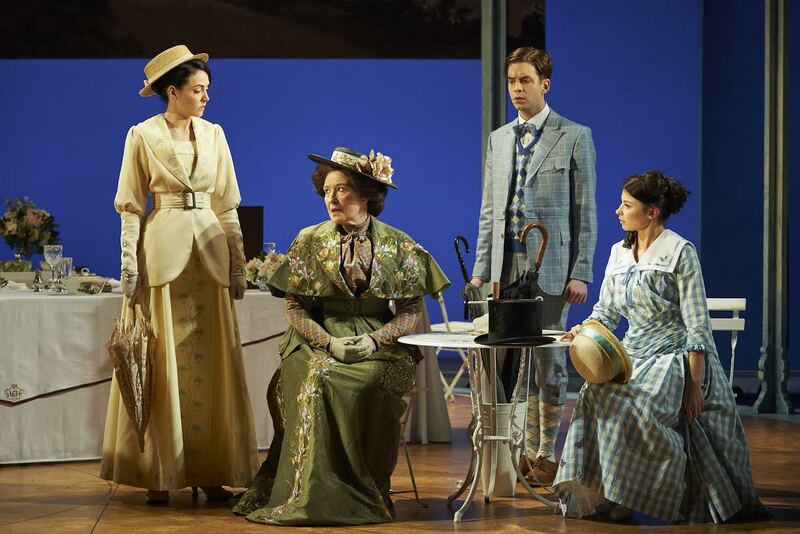 The Importance of Being Earnest is showing at the same time as Shaw’s You Never Can Tell, a similar tale to Wilde’s societal classic, in that this is a play about social standing, the upper class, sensibilities, romance and the absence of family members. 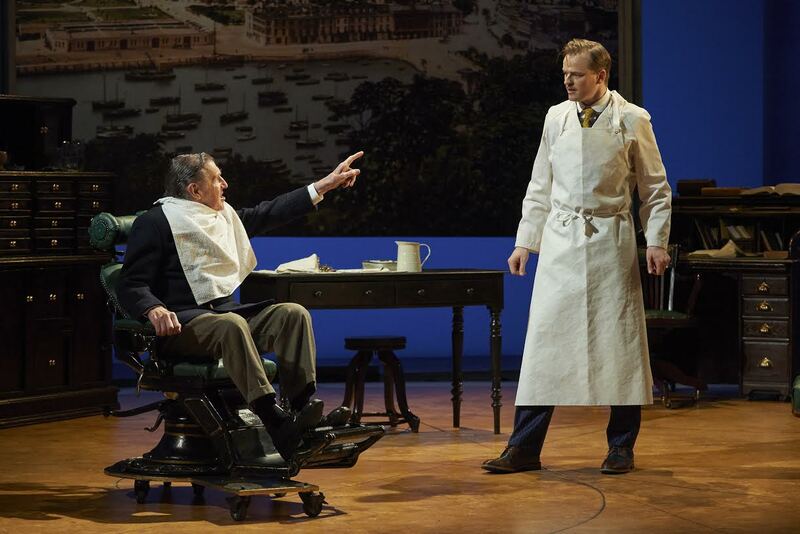 The towering character of You Never Can Tell is the waiter, actor Niall Buggy, who is nicknamed affectionately as ‘William,’ after Shakespeare. And this isn’t the only reminder of the much lorded English writer. The script runs in rapid-fire, like a tap-dancing stanza, leaving the audience almost struggling to catch up at times. And the opening set is dream like, reminiscent of something from A Midsummer Night’s Dream. One of the most charming and amusing characters of the play, Dolly, played by Genevieve Hulme-Beaman, enters with her pantaloons rolled up as she paddles innocently through a pool around an island. We are already intrigued by this young woman’s sense of fun and the island – which transpires is an English sea-side town – will become the home-from-home where attempts will be made to tame her child-like spirit. Again, Dolly is seen displaying the rambunctious manner of a spoiled tot, as she prances round a dental office where she is having a tooth pulled by a man who will soon become integral to the plot, Valentine, the social-climbing dentist, played by Paul Reid. Soon, the entire family enters the scene. Once Dolly has her tooth pulled and makes enough enquiries, we are introduced to her mother, Mrs Clandon (Eleanor Methven), the other half of Dolly, her equally rude yet delightful brother, Philip (James Murphy) and the rather more morose character of (Caoimhe O’Malley). As soon as Valentine sets his eyes on the sullen, yet enticing Gloria, the strangest of romances is to begin. He pursues and she pulls away, punishing herself for allowing him to kiss her later in the performance. Gloria is a symbol of a confused feminism. She could so easily be a character written in today’s society, as women struggle still to carve a place as career women-mothers-and-wives in a world where women are expected to be all. Gloria has been taught the values of feminism by her mother, Mrs Clandon, who writes a variety of books on 20th century behaviours. We learn as the play unfolds that Mrs Clandon hasn’t ever been in love so it is understandable her daughter is so confused about affairs of the heart. “So you see, though I am a married woman, I have never been in love; I have never …” she confesses later in the play as we see her power is perhaps the very thing that has also left her weak and unable to fully guide her daughter. Unfortunately though Methven, who plays the matriarch, who is clearly one of the most talented actors of the piece, does not shine as much as she might. Her prowess is not displayed enough and it would have been pleasing to hear more from her. Though this was how Shaw intended her character to be. As it is William, Dolly and Philip, steal the show. 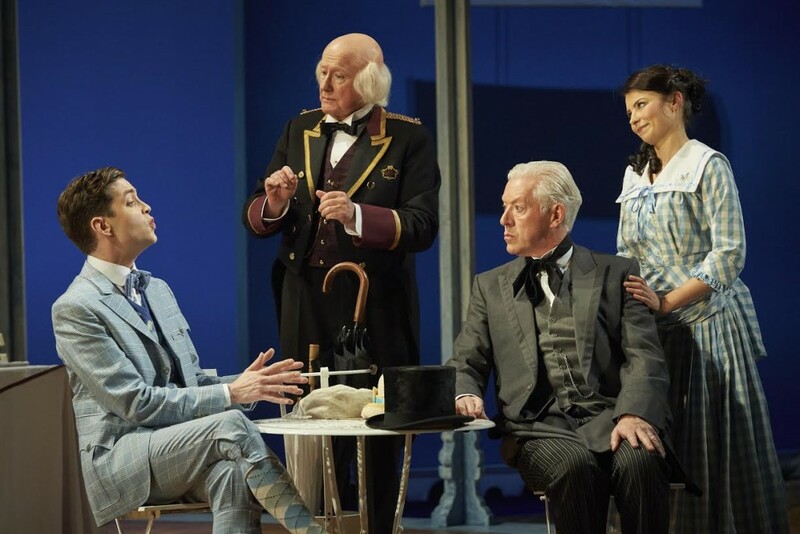 These characters provide all the laughs and with regards to Philip, there was at times a sense of pathos mixed with the comedy, particularly when he follows the father he has only met to the ball for a dance. Eamon Morrissey, who plays angry, Irish man and absent father, Mr Crampton, is not a likeable character and his acting skills were not perhaps best displayed in this role. For me, there were various themes throughout the play that are still very relevant in today’s world. Mrs Clandon is a single mother, a feminist, who had suffered abuse at the hands odious Mr Crampton. Her children have grown up under her guidance in Portugal and for the first time in 18 years, she returns to England, where they will meet their estranged father. As the charmless Valentine explains at the start of the play, he cannot possibly be friends with Dolly and her twin because they have no father. Here, we are reminded of an Ireland not too long in the distant past – and an attitude that still rings true today among the minority who still hold such prejudices. We also witness as rather tragically Gloria’s spirit is crushed and she gives in to the thought of marrying Valentine – though he does not seem to be an intellectual or financial match for her. And it seems she has not lived a life of freedom long enough to do as other women she despises have done, tied themselves to a man. However, the fact she has chosen the engagement and to a man who is penniless, does give her some individuality and strength in an age of female oppression. The sets are opulent and magical throughout and never more so than at the hotel, where the Clandon family are staying, on the night of the ball. Colourful lanterns hang from the ceiling and grand, maroon curtains are draped downward. The costumes are also an absolute delight. From the rigid, stuffiness of matriarch Mrs Landon’s dress, almost caging her torso, to the outlandish and brilliant clothes worn by the twins. Their costumes are symbolic of their individuality and they dazzle just as the actors wearing them. The twins and the waiter with his comedic and over-blown “Thank you maaaam,” and his “mmmmmms” after each sentence, amused the audience, as did the playful audacity of the young siblings. 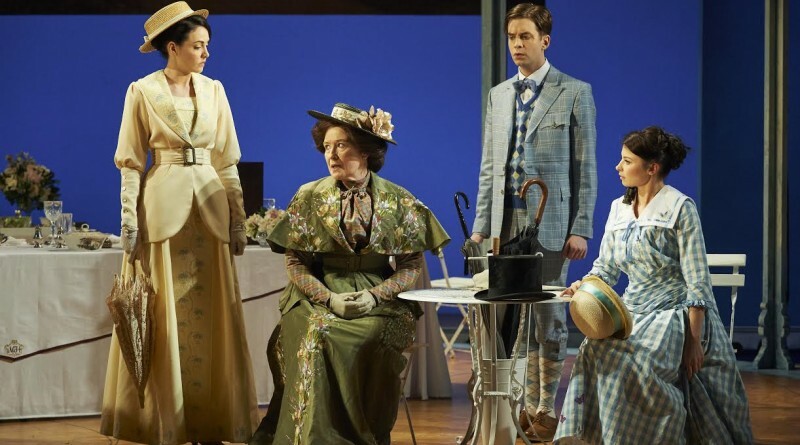 It’s true, there was no Lady Bracknell and the “handbaaag,” was most definitely absent – but without doubt there was echoes of ‘Importance’ within this play. Perhaps the 120-year-old argument between Shaw and Wilde will not be settled at the Abbey Theatre, Dublin, but as a lover of Wilde, one thing was sure for me as a viewer. I chose to see this performance over ‘Importance’ because that was the first play I’d ever seen at the age of 14 and I’ve seen it several times since. It is a beloved play. One that reminds me of my own youth and some of life’s great questions – love, romance, relationships and loss, all wrapped up in a pretty and pleasing box of fun. I’d never seen a Shaw play, much to my shame. This is now something I will change. I thoroughly enjoyed You Never Can Tell. It was at times amusing and delightful and managed to carry serious themes without bogging the pre-festive audience down. Like a breath of summer air, the play is light and breezy, for an audience braving the December cold. More so, my teenage daughter, loved the performance and remarked ‘If people stopped watching X Factor and watched shows like this, we might have more intelligent thoughts,’ – and I couldn’t help nodding and agreeing. Thankfully, there was no sign of a Simon Cowell at the Abbey this week. 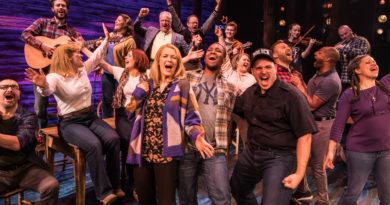 The play runs until February 6.